I think crushed cans make great subjects, great work! This is fabulous Debra , you really have a magical touch. Bravo! It's your sketchbook, you can add anything, anywhere you want. 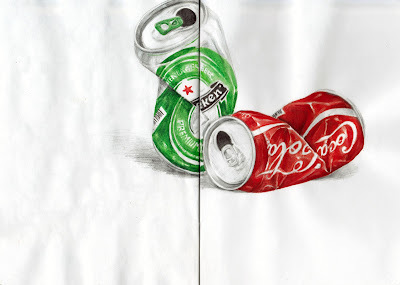 These cans are wonderfully drawn. These are so cool! Wonderfully done! I've been thinking about painting crumbled paper... I may do crushed metal next. I am in total awe over how realistic these cans look and still maintain that artistic flare. I love this! i think a couple of crushed cans could give hours, days even, of drawing pleasure. wonderful work. I love this! Great! The colors are just perfect!